SOMETHING wonderful has recently taken place in Alaska. This is the drifting away of icebergs from the front of Muir Glacier in Glacier Bay so that for the first time in nine years this famous glacier, the father of all glaciers, and the most noted on this continent has been visited. In 1889 a subterranean earthquake took place at Yakutat and, ever since, the approach to this glacier has been so choked with ice that boats have turned away with their passengers disappointed. Now, through some peculiar drifting of the ice, steamboats can enter the channel and go near the right wing and after cautiously pushing their way get a glimpse of the left face. This is without doubt the most remarkable known glacier on this continent, though Alaska has other wonderful glaciers which occupy clefts high up between mountains and some of which have an elevation of six thousand feet. Among these are the Taku, Davidson, Windom and Le Conte. 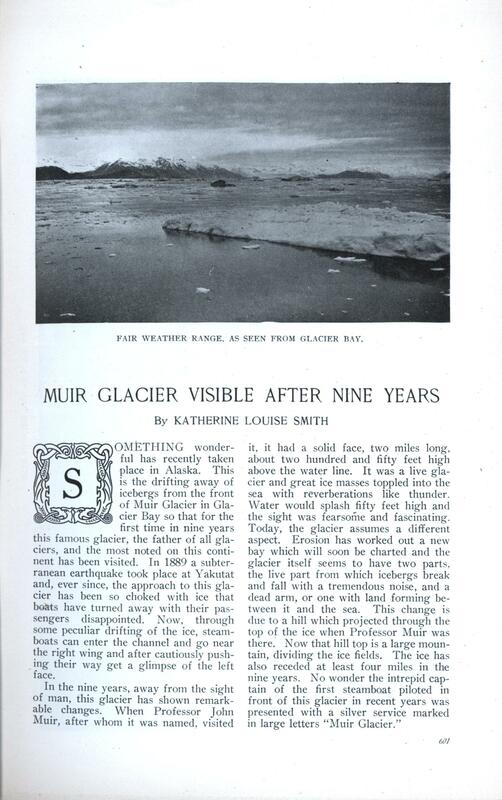 But Muir glacier has three hundred and fifty-four square miles of ice and presents such an imposing sight that it is considered the crowning glory of Alaska’s stupendous scenery—the sight of a lifetime. No one knows how it happens that Glacier Bay can be entered now where it could not before but it is thought that favorable winds and mild weather caused the ice to drift away. An interesting fact about Alaskan glaciers is that some are “dead” and others are “alive.” Davidson Glacier, which is really a tongue of the Muir Glacier, has been ascended by travelers for a number of years. It is a “dead” glacier having a moraine of several miles between it and the sea. Looked at from the boat it presents a kaleidoscopic appearance as the sun shines on it, and the surface seems scratched with tiny pin lines. These are in reality deep crevices which must be approached cautiously for they are lurking pitfalls for the unwary. To reach Davidson Glacier the boat stops some miles from shore and those desirous of ascending are taken ashore in small boats. Sometimes the water is so shallow that the last of the trip is accomplished on the sailors’ backs. The trail to the glacier is across a moraine two or three miles deep. A hay field, a stretch of ground filled with Alaska’s showy fire weed, and a strip of gravel are passed. It is well worth while to climb back on this glacier and to behold from it the continuous panorama of mountains that stretch to view.